WASHINGTON — Congress is expected to pass relief aid for victims of Hurricane Harvey as early as Wednesday and GOP leaders are looking to take advantage of the overwhelming political support for it by including controversial legislation to lift the debt ceiling in the overall package, multiple congressional sources tell NBC News. The House of Representative will vote on a $7.85 billion Harvey relief bill Wednesday, a package that is expected to pass overwhelmingly. And it couldn't come soon enough: FEMA has alerted Congress that their disaster relief funds will likely run out this Friday, Sept. 8, according to multiple congressional aides and Sen. John Cornyn, R-Texas. The measure will then go to the Senate where Republican leaders will add legislation to increase the debt limit, beating an end-of-September deadline where the U.S. Treasury would no longer be able to pay its existing bills. 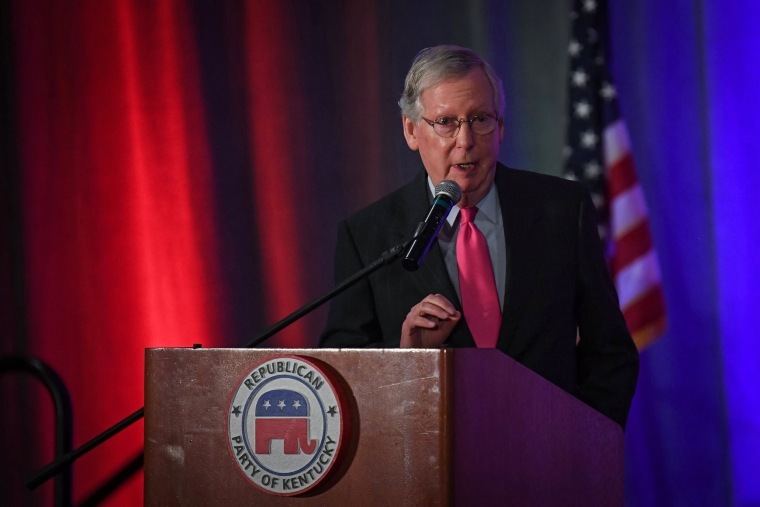 It’s unclear how long it will take the bill to clear the Senate, however, given that the move is likely to irritate fiscal conservatives who oppose increasing the debt limit and want budgetary reforms and spending restrictions in exchange for voting to increase it. Sen. Rand Paul, R-Ky., has said he will object to adding the debt ceiling to the Harvey aid bill, which could delay the bill past Friday — and then it still has to go back to the House for another vote. But including the debt limit in the disaster relief bill could avert a public intra-party fight as it will make it difficult for critics to vote against aid for those left in the wake of Harvey, especially since some of the biggest fiscal hawks are from storm-devastated Texas. Some conservatives are also expecting a continuing resolution, also known as the CR, to temporarily extend current levels of government spending to be added to the Harvey aid package as well. But Republican leadership sources say that the CR might not be done in time and they say they won't hold up Harvey funding to wait for it. Congress needs to pass funding bills, or a CR, by Oct. 1 to keep the government open. What's also unclear is how long the debt limit will be lifted for. Democrats want a short-term lift, until December. Republican leaders, however, are pushing for an extension until after the mid-term elections next November. Harvey aid, the debt limit, and a government funding bill are just three of the items Congress must address this fall in a jam-packed schedule. They also must reauthorize the flood insurance program, the low-income children's health insurance program and the Federal Aviation Administration. Republicans also want to tackle tax reform. Republican Congressional leaders are meeting with President Donald Trump Tuesday at the White House to discuss taxes.